Keep up-to-date: all updates, tips and tricks on our label software. Directly from the developers. The software, which was developed by cab, opens the full potential of cab devices during design: An extensive instruction set is available in the intuitive user interface, e. g. different date formats, mathematic or logic functions. At the same time cablabel S3 connects all cab marking systems: First you design the label. You decide not until printing whether you want to print on a label printer, a print and apply system or a laser marking system. Do you want your marking system to print independently of a host system, in the stand alone mode? cablabel S3 supports you here again: after design the software supplies you with the required data which are stored within the printer for stand alone mode. cablabel S3 is of modular design and can be adapted step by step to your requirements: elements like the JScript editor are embedded as plug-in in order to support native programming with JScript. If you change the label in the designer user interface, the display in the JScript viewer is aligned in real time. Special functions like Database Connector or bar code tester can be integrated easily. Companies structure the label printing differently. For example creation and production are executed by different employees. To adopt the software package to your company cab offers different products. cablabel S3 Lite is delivered free of costs with every cab printer and allows you to create and print simple labels. With cablabel S3 Pro you create label designs for professional industrial sector and develop solutions for your label printing. cablabel S3 Print is provided for users in production or warehouse. The user interface is simplified and makes only those functions available which are required for label print: You select the label in a list and get the layout for visual control. Then you enter the variable information and the amount you want to print. This simplifies your work and reduces possible sources of error. cablabel S3 Demo enables interested users to install and to test the software for free. All functions of the Pro-product are available, except the JScript viewer and the support for stand alone mode. Printing is also possible, but limited only for testing. The use is limited during 30 days and for one activation. With the laser products you get the function volume according to the Pro product respectively the Print product and additionally the possibility to release content on a laser marking system. You automate the print processes for the control by external applications like an ERP system via web services (SOAP interface) or file interface (XML, CSV, ASCII) with cablabel S3 Print Server. With this product you integrate cab marking systems in your process chain in order to print up-to-date data like measurement or test results in labels. cablabel S3 Viewer shows the preview of a label in the Windows Explorer. The Viewer may support you for example in approval processes or supplier requirements. The product is delivered free of costs with every cablabel S3. 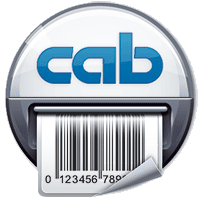 cablabel S3 - the new labeling software - made by cab. Features and benefits. You need to reinstall cablabel S3?